Welcome to the Banting House Blog! In the early hours of a late October morning in 1920, Frederick Banting woke from a fitful sleep and wrote down 25 words that ultimately led to the discovery of insulin. Today, the house where he conceived that idea has been turned into a museum honouring the life of a truly great Canadian. Fred Banting did a lot more than insulin though and part of our goal is to help more people discover the man they thought they knew. I’m Jen, and I’m spending my summer here at Banting House National Historic Site of Canada as a museum intern. I’ve started working on a number of exciting projects that will benefit the museum and its public. Check out the Events page to find out about some of the events we’re holding this summer, and stay tuned for more information about how to hold your event at Banting House. Our Banting & Friends IV art exhibition and sale is held in Sir Frederick Banting Square (south side of Banting House) from Friday, July 13 to Sunday, July 15. We’re also planning something big for World Diabetes Day on Wednesday, November 14, 2012; check back soon for more details. Please get in touch with us if you or your organization would like to be involved. Do you know what a medical tent looked like in the First World War? Dr. Banting was a war hero before he became a medical researcher. The revamping of our Military Gallery this summer will provide a representation of the conditions in which doctors and surgeons in the First World War had to work. Come visit us to find out more about Banting’s involvement in military medicine in the First and Second World Wars. 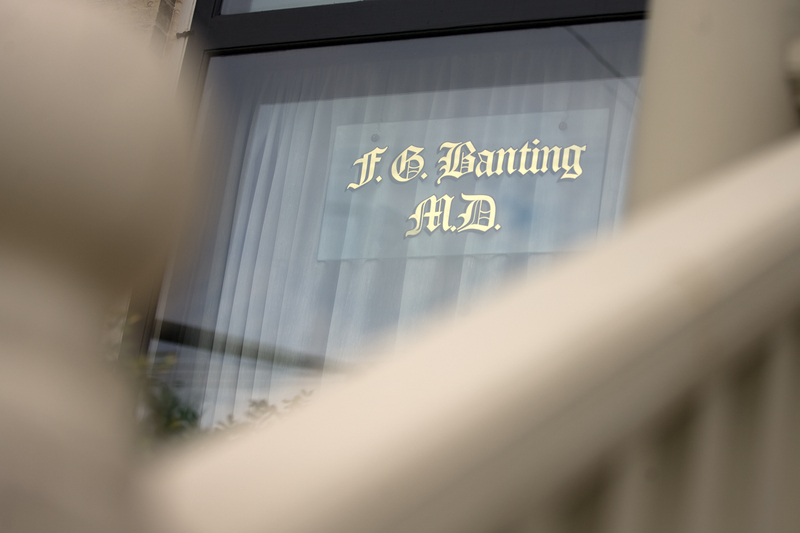 The local Canadian Diabetes Association offices are also housed at Banting House. Their summer intern, Kayla Brown, has maintained a blog since being diagnosed with Type 1 diabetes several years ago and now has over 30,000 followers. Click here to check it out! Has the discovery of insulin and diabetes affected your life somehow? We invite you to come into our museum and leave a “Dear Dr. Banting” note in his bedroom. People leave messages from all over the worlds in all different languages, alphabets, and scripts. Every week we highlight one of these messages on Twitter and Facebook. If you can’t make it in, but want to share your thoughts anyway, please feel free to do so here. We, on behalf of Dr. Banting, look forward to hearing from you. Keep checking in with us here – we will be posting new content regularly. I’ll keep you up to date on our events, highlight some of our artifacts that aren’t currently on exhibit, and hopefully teach you a bit about Sir Frederick Grant Banting – the man you thought you knew. If there’s something specific you would like to see here on our blog, please leave a message in the comment box below. We want to know what you think of us! In the meantime, like us on Facebook and follow us on Twitter to keep up to date on all of our news and posts. And if you’re looking for a way to beat the heat, why not come visit us? Posted in Museum Happenings and Events.Tagged Banting and Friends, Dear Dr. Banting, Events, Military Gallery, World Diabetes Day.